Off to School of Infantry Graduation! Off to Camp Geiger, Marine Corps Air Station, New River, North Carolina (near Camp Lejeune) to see my son graduate from SOI. Graduation from Boot was filled with marching, pageantry, bands, speeches and much pomp. My understanding is that this is much more austere. Five minutes, and then they get picked up by the fleet. Standing on the parade deck at Parris Island, S.C. My father was in the 82nd Airborne. 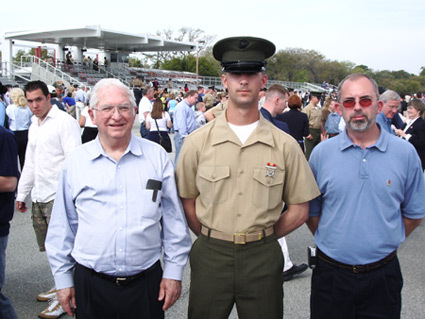 My son, Daniel, is in the middle wearing his Marine rifle expert badge the day of graduation from Boot, in his service alphas. I am the ugly one on the right. The rage we feel at the “justices” of the left, who have given us some of the worst decisions ever made (and who, by the way, I predict will be reversed on many things in the coming years), is justified. This rage should not cloud our judgment as to what the decision really says. In “New Taliban and Al Qaida Strategy,” I scoped out what I believe to be a revised “going-forward” plan for the terrorists and insurgents in Iraq and the Taliban in Afghanistan. It primarily involves the terror tactics used heretofore, such as beheadings, torture and other acts of brutality. But there are two elements present in this approach that seem to have been previously absent. The U.S. forces, and especially the Marines, were keenly aware of the fact that factions of malcontents, thugs, criminals and other shady elements of society would band together into heterogeneous groups and cause general harm to the effort of the coalition forces. This was described in the Marine Corps “Small Wars Manual,” 1940 Edition. The two new elements we are seeing now include (a) the use of non-combatants as shields, and (b) an aggressive propaganda war to allege U.S. troop atrocities. I have discussed in earlier posts, Haditha, Hamdania, and then Guardsmen being charged with civilian deaths near Haditha. The Marine Times carried an AP story about the proliferation of charges against U.S. troops, and so the issue is being recognized by the MSM (although I see the article as being somewhat wobbly, coming to no real conclusions and providing no substantive framework for this phenomenon — an interesting failure given the title of the piece, Experts: Put atrocity accusations into context). At least one of these three instances involved the use of civilians as human shields, and two others involve the killing of civilians in the heat of battle (the circumstances will be brought to light at trial). To diminish the U.S. public resolve. To make the U.S. troops hesitate when in potential danger, thus making Iraq a much mroe dangerous place for them. To proliferate instances of accusations against U.S. troops as the insurgents and unsympathetic public better learn how to engage in this slander. And thus to dishearten the U.S. troops. The U.S. troops will be impaled squarely on the horns of a dilemma: do I defend myself if I feel threatened, thus ensuring charges if I kill a civilian who later is found out to be unarmed or used as a shield, or do I hesitate, thus ensuring my harm? I went on to explain that Haditha had everything to do with the war in Iraq being a counterinsurgency. And every student of military science understands the ugly nature of insurgencies; where insurgents are un-uniformed, unconventional fighters who move freely throughout the community during the day, and become bushwhackers at night. They routinely use women and children as human shields, and often coerce the latter into the service of operating guerrillas. This is particularly effective against U.S. forces, because the enemy knows that no matter how much stress they may be under, American soldiers will go to great lengths to avoid killing women and children; and even hesitate (at great risk to themselves) when they see women and children shooting at them. There are the horns of the dilemma. Each and every time a Soldier or Marine fires and a civilian is killed, he can just about count on some other civilian being a “witness” to the incident where the account has him guilty of murder execution-style. Whether this is true or not, the seed is planted in the minds of the Soldier and Marine and eventually becomes a cancer. Alleged incidents of misconduct, such as those surrounding the Nov. 19 deaths of 24 civilians in Haditha, Iraq, do not reflect the honorable service of the overwhelming majority of coalition forces in Iraq, a U.S. general in Iraq said today. In my opinion, this is profoundly unhelpful. As far as the General knows, the U.S. forces perform their duties completely and without exception. At the very minimum, he should have waited until the trial was finished before anything was said about what some small percentage of our troops do. The General doesn’t know for sure. He is speculating on Haditha. And this is the heart of the matter. Will the U.S. brass react to this new strategy by participating in the proliferation of charges against our troops, or will our troops get the benefit of the doubt? Will our troops fear defending themselves, or will they react as they are taught to? The Marines are taught that their purpose is to “locate, close with and destroy the enemy by fire and maneuver.” Will they be free to do this? This is an admittedly small and inadequate tribute to the honor, character and courage of Staff Sgt. Christian Bagge, a double-amputee who lost one leg above the ankle and another above the knee to an IED in Iraq about a year ago. Today … he runs with the President. This is way cool. By the time we pass away, most of us will never be half the man that Staff Sgt. Bagge is right now. Playing Political Patty-Cake with Iran? But we should remember that this commentary is by Richard Perle, and like everything else he writes or says, it is moralizing, preening, self-serving and condescending. When Richard Perle speaks, it is the “gospel according to Richard.” This, in my opinion, leads Perle to believe that the Bush administration has “blinked.” This might just be a fatal error for Perle’s analysis (and for Iran, if they agree). The troubled Iraq war also hangs over Iran diplomacy. Administration officials have little confidence in the intelligence on Iran’s programs, while allies overseas view U.S. actions through the prism of Iraq. That concern has forced the administration to emphasize diplomacy to avoid the breach with its allies that characterizes the Iraq war. 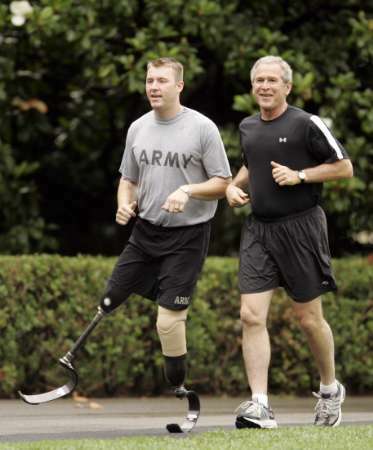 Officials said there was essentially no dissent among Bush’s top advisers on joining the talks. The Pentagon raised no objections, and the only cautionary tone came from Cheney, who said that the shift should not lead the administration down a “slippery slope,” in which they end up retreating from their core red line: an end to enrichment and reprocessing — the two paths toward fissile material. The group agreed to hold their red line. It would appear to me that the Iranian thinking on this is wrongheaded. There is apparently no desire to rush to war with Iran, especially when these issues are seen through the prism of Iraq. However, the needed steps have been taken. The international community has been briefed. They have been courted. They have even participated in the development of the package of incentives to lure Iran away from a nuclear program. When the difficult time comes, that is, when Iran refuses to end the program, and the decision must be made either to end the program ourselves or let Iran go nuclear, the U.S. will say, “we did our best.” Besides, you were involved just like we were. Additionally, it gives the U.S. intelligence community the time to QA (quality assure) the information it is giving the administration. Iran sees this as a win for them. The U.S. sees this as a win-win. And so Richard Perle is still on the outside looking in. Just the way it should be. I float a view in two earliers posts (Haditha Hoax and Future Knee-Jerk Reactions, and New Taliban & Al Qaida Strategy) that this is part of an overall pattern of propaganda by the enemy. Did Iran Help Bag Zarqawi? Citing Iranian sources and Iraqi sources close to ex PM Alawi, the paper states that Jordanian intelligence may have gotten help from Iran in pinpointing Zarqawi’s location. A few weeks ago the Iranian FM met with King Abdullah in Amman to allegedly negotiate the deal. Then a few days later the Iranian FM was in Bagdad meeting with Iraki PM AL Maliki and allegedly US Ambassador Khalilzad. Coincidence or not the US position softened around that time when for the first time Secretary of State Rice announced a possible ouverture to Iran. People close to Reza Pahlavi, the Shah’s son, also believe that Zarqawi was indeed handed by Iran as part of a package. Keep in mind that this info is really very speculative but might not be as far fetched as one thinks. I don’t think that this is far fetched, but it still seems of dubious quality to me. I have serious doubts about it. First, U.S. and Iraqi (but mostly U.S.) forces have interdicted Iranian IED supplies at the border for many months now. It is a well-known fact that much of the IED technology and materiel being used in Iraq comes from outside Iraq, and more specifically, from Iran. Iran stands to gain by a Shia-led Iraq, as Iran is a Shia theocracy. While it might have been strange bedfellows for the Iranians to assist Zarqawi, Iran benefited (or so the thinking went) from the insurgency and the potential undoing of the democracy being put into place in Iraq. There was a very pragmatic reason for Iran to assist Al Qaida in the terrorism it perpetrated. So the question is, why would they do it? I see no compelling reason. It is a non-starter (in southern-speak, “that dog won’t hunt”) to say that Iran wanted an end to the violence and a stable government, just as long as the government was Shia. An end to the violence would mean that the U.S. is no longer distracted from what will be the main focus of 2007 — Iran. Further, certainly Iran was not foolish enough to believe that the gift of an individual, no matter how important, would dissuade the U.S. from preventing a nuclear Iran. However, let’s assume for a moment that this is real. Certainly, one is forced to believe, Condi and W are not wobbly enough to actually amend foreign policy over something so significant as a nuclear Iran (which has implications not just for the region, but for the next century) for the sake of an individual. In fact, this would seem to be counter to the thinking heretofore. The U.S. has not gone wobbly over peace between Pakistan and India, even for the sake of Osama (I am not saying that Pakistan has offered Osama for the sake of warring with India; but it is important to remember that the U.S. has made “friendly” with India over their nuclear program, to the chagrin of Pakistan). It makes for an interesting thought-experiment, but it seems to me to be counterintuitive. Tue Jun 27 2006 09:25:10 ETIran’s supreme leader Ayatollah Ali Khamenei has rejected the prospect of talks with the United States on the nuclear program, saying nothing would be gained, state television reported Tuesday.“Negotiations with the United States would have no benefit for us, and we do not need them,” the television quoted Khamenei as telling Senegalese President Abdoulaye Wade. I think that this confirms my view. You are an idiot and a stooge. Such expert opinions are always valued (as in, taken for what they’re worth). anything. I have not been dissuaded from my initial summary. I see that your colleagues have said that you are a loser. I concur. I guess that this about covers it. As I said in the post immediately preceeding this one, the U.S. should prepare for more charges in the deaths of civilians in Iraq. I will not comment on the veracity of these particular charges. I have not on Hamdaniya and I won’t on this one (although I weighed in on Haditha). However, I will comment that this kind of thing is unfortunately endemic to war. Mistakes are made, civilians get caught in cross fire, and in Iraq, the insurgents are now using civilians shields (and futhermore, the difference between insurgents and civilians becomes blurred). I have read on the Milblog sites those in Iraq say that all things considered, if the U.S. troops feel threatened, they will defend themselves. And just for the record, I support that position. If all the insurgents have to do to make our troops cease and desist from firing is to find a civilian to pull in front of thelselves, then bring our boys home now. We cannot win this war. Once again, I do not know the veracity of these charges (or the lack thereof). I do expect these kinds of instances to increase, leading to charges against U.S. troops with increased regularity. This, in my opinion, is a bad trend, maybe even a fatal one. Finally, a spokesman for the USMC (as reported on CNN) has said that the charges against the Camp Pendleton 8 “shows the world that we have a different standard than them.” Um, excuse me, but I have no desire to show the world anything about our standards. This is a profoundly poor excuse for bringing charges against Marines. I want to win the war. This will show the world that the U.S. wins its wars. Two US soldiers have been charged over the killing of an Iraqi civilian near Ramadi. Specialist Nathan Lynn was charged with voluntary manslaughter for allegedly shooting an unarmed man on February 15. Lynn and a second soldier, Sergeant Milton Ortiz Jr, were charged with obstructing justice for allegedly conspiring with another soldier who reportedly put an AK-47 near the body in an attempt to make it look as though the dead man was a fighter.Ortiz was also charged with assault and communicating a threat in a separate incident on March 8. He allegedly put an unloaded weapon to the head of an Iraqi man and threatened to send him to prison.The soldier who allegedly placed the weapon near the body was redeployed and left the army before criminal proceedings began.Both soldiers – from the 1st Battalion, 109th Infantry (Mechanised) of the Pennsylvania National Guard – are being held in Baghdad while they await hearings which will determine if there is enough evidence to hold to a court martial. My comment: I could not find the complete charges anywhere except Al Jazeera (if they can be trusted). If it is true that a GI was charged with putting an unloaded weapon to someone’s head and threatening to send someone to prison, then I am concerned in the superlative degree. No, I am not concerned about what the GI did. Our GIs are going to be second-guessing every move they make. It will paralize them. I am truly becoming concerned about our willingness to wage and win this war. Now for the AP story. BAGHDAD, Iraq – The U.S. military has charged two Pennsylvania National Guardsmen in the February killing of a civilian near Ramadi, the military said Sunday. Spec. Nathan B. Lynn, 21, of South Williamsport, Pa., was charged with one count of voluntary manslaughter for allegedly shooting an unarmed man on Feb. 15, the military said. Lynn and Sgt. Milton Ortiz Jr., both of the 1st Battalion, 109th Infantry (Mechanized) of the Pennsylvania National Guard, were each charged with one count of obstructing justice for allegedly conspiring with another soldier who allegedly put an AK-47 gun near the body of the man in an attempt to make it look like he was an insurgent. Ortiz, 36, of Islip, N.Y., also was charged with one count of assault and one count of communicating a threat for a separate incident on March 8 when he allegedly placed an unloaded weapon against the head of an Iraqi man and threatened to send him to prison, the military said. Both soldiers are in Baghdad awaiting hearings to determine if there is sufficient evidence for a court-martial. Maj. Joseph Todd Breasseale, a military spokesman in Baghdad, said Ortiz and Lynn are not being held in a prison but were not allowed to return to the United States with the rest of their unit last week. Both have been given the option to retain lawyers, but neither has made a decision yet, he said. Lynn’s father, Williamsport police Capt. William Lynn, has told The Patriot-News of Harrisburg that his son maintains his innocence. He did not return messages left by The Associated Press on Sunday. Lynn joined the Guard in 2002, Ortiz in 1991. Members of Ortiz’s family did not return telephone messages left Sunday.